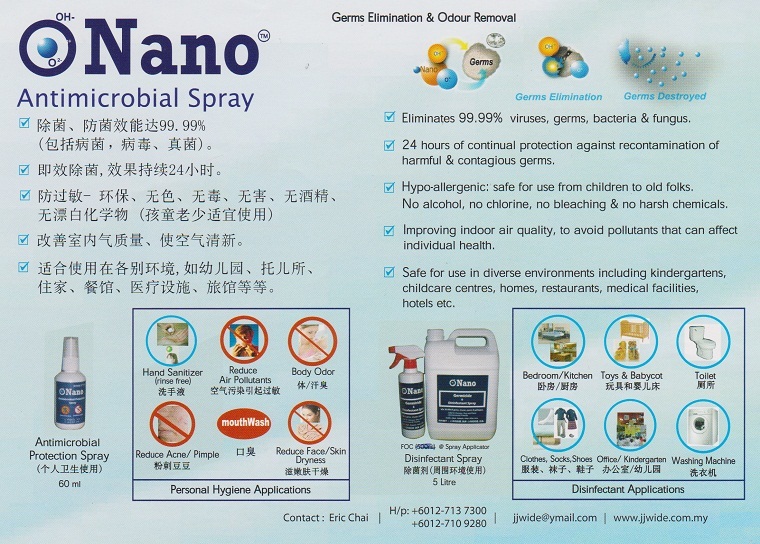 ONANO.ros Germicide & Disinfectant Spray is a specially formulated germicide & disinfectant. It adopts Nano-Technology and is effective to eliminate harmful micro-organism consistently with residual action and keep environment safe. Non toxic, safe for use. ONANO.ros only eliminates micro-organism with single cell. It is not harmful to human with multiple cells. "HFMD is usually mild and self-limiting. Treatment can be given to relieve the symptoms but there is no antibiotic or vaccine for the prevention or treatment of HFMD".